The third — though not necessarily final — project in our trio sequence is now live. I was so excited to add some 808’s to it with vocals recorded on SM7B with the Roland DJ 808. With an EQ rack I built in live with heavy ducks in the 30-250 Hz range. I then in a separate session recorded the vocals with the same patterns. I created a few loops of the vocals I liked in separate clips. I grouped with some compression added effects prior to routing to the main mix. I then combined with the instance I created with the 808’s. I then played thru the session in Live 10. This is a collaboration with the piece TuTu Looking Bass Wolf Code MtnView by Vonna Wolf, which had been created using MtnViewMark-Bits’s Trioh - Bass and Trombocoder by Eithan Hein. This had a very tribal feel, so I decided to work with that in the respect of featuring a clarinet part that could act as a dance. I used the same instrumentation that had been used in the previous two tasks. Engage Trio was written for Flute, Oboe, Clarinet, Bassoon, Violin, Viola and Cello. it evoked someone trapped alone in a decrepit listening station on the edge of the desert during a brutal sandstorm, listening to the fading signal of a guitar on the radio as the storm whipped around outside. I dropped the track into Ableton Live, added some limiting, and then added guitar with reverb, plus EQ to isolate mids (I used an Epiphany Joe Pass model, a wonderfully spooky sounding guitar). The melody line is heavily improvised but inspired by the ghost chords that seem to emerge from the shadows of the underlying tracks. I took UntilledSound “Disquiet0368 - Clean And Dirty” (pre-existing track). 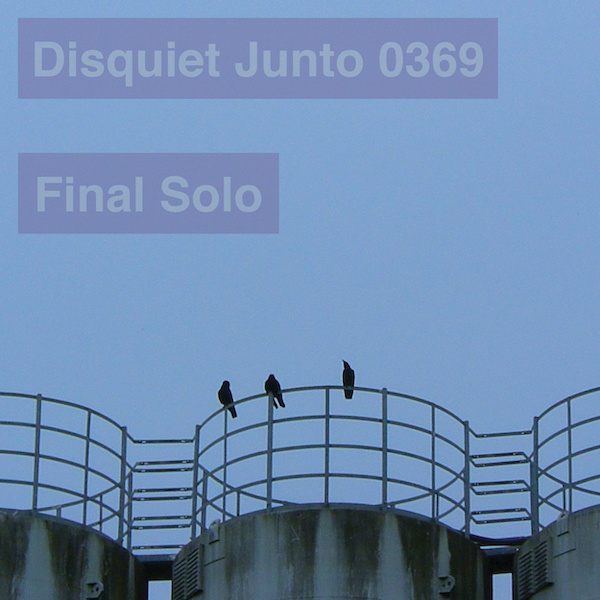 UntilledSound added drums to dnealelo/circlingcrows “disquiet junto #367 Trio Initiate” (prior pre-existing track). Clean And Dirty. Such a peculiar track I went for a minor and quiet addition. Involved tools are Yamaha QY-10, Phonogene eurorack sampler module, envelope follower, filters and an analog delay pedal, field recording… At least it is not less peculiar now? As I’m adding final third of a trio, I make a final mix (using Audacity). Hello everyone. For my backing track I used the evocative “Feedback Feedback” by bassling, featuring the ambient room recording of @swhic in the left channel and the upright bass playing of @bassling in the right channel. Thank you both for making this disquiet project so enjoyable!! I like disquiet because you never know what to expect. I wasn’t expecting that - fantastic!! It is cold and rainy in the south of England today so I chose the brilliantly sunny groove collaboration between @ikjoyce and @DeDe as the track to add to. I listened to the original a few times and took note of the existing form of the piece as it seemed to me. I found myself humming a little melody over the opening section so I learned it on guitar and jammed with it a little. I modified the theme slightly to fit with the different 3+3 feel of the end half. I then played a couple of takes around the structure: Intro grooving, theme, solo, bass solo/breakdown, theme variation. Once again, I know that I won’t have the time to fiddle with this again before the submission deadline so I’m setting it loose into the world now despite feeling that I would like to have a couple more stabs at it! @joyneski and @SityPhoxx 's lovely mysterious track. I try to make this better if I have time or even make something good out of the other tracks just for fun, but this is what I have today and must say I spent a nice morning with you guys. Excellent, I think my bass made Ian’s track a bit Caribbean, but now you took us all Afro-Beat galore! I know that feeling, same here most of the times I participate in these juntos and more than ever this weekend, but your jam sounds awesome, focused and loose at the same time. You can relax, it’s a great one. Thanks, I’ve been really enjoying your contributions too. Quite nice, working with my rather impossible offering. @bearp-aw and @gentil created something that seemed pretty busy and quite full, so I took this piece as a bit of a challenge not to piss all over what they had accomplished. I tried to just lay some dreamy, droney noise in the center. I can’t imagine it’s what either of them expected, but I like the idea that these collaborations take sharp turns. Great project, Marc (@disquiet). It’s a nice way to get into the new year connecting with strangers. I’m looking forward to digging into everything the rest of the community does. @Tunnelwater and @mateo who shared a nice hour with me here in Paris this morning. Oh my, this is brilliant!! I really love how this went in a completely different direction to what I was expecting. I’d actually love to do more collaboration in this style, a sort of electro-afro-jazz fusion thing.